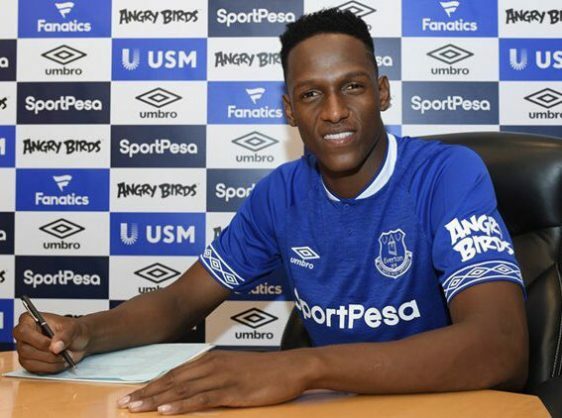 Mina, a 23-year-old central defender who scored three goals in three games for Colombia at the World Cup, will move to Goodison Park in a 30.25 million euro (£27 million, $35 million) deal with the Catalan giants, plus 1.5 million more in add ons, Barcelona confirmed. One of Mina’s goals in Russia was against Everton’s England goalkeeper Jordan Pickford to send a dramatic last 16 tie into extra-time. And Barca were keen to cash in on the 23-year-old, who cost just 11.8 million euros seven months ago. Likewise, Portuguese international Gomes has failed to establish himself as a first team regular since joining from Valencia for an initial 35 million euro fee in 2016. His season-long loan will cost the English club 2.25 million euros, Barca said in a statement. Bernard, a 25-year-old capped 14 times by Brazil, was a free agent after his contract with Shakhtar Donetsk expired and said Portuguese manager Marco Silva played a big role in attracting him to the club. “I chose Everton because of all the things I had heard about Marco Silva and after speaking to him I was happy with what he said to me,” Bernard told Evertontv. “The manager made me feel confident about playing here. He is a very good coach and he has achieved really good things at other clubs.